In the early days of CD box-sets, the Rhino label were responsible for some of the finest ever. One of these was the Jack Kerouac Collection. The three-CD set was released in 1990, and went out of print rather quickly. My guess is that the audience for beat poetry set to jazz is rather specialized. I though I had missed the boat for good regarding this material. So when I heard that the Rock Beat label were issuing both Poetry for the Beat Generation and Blues and Haikus as stand-alone discs, I was stoked. The idea behind each album was fairly basic. Both feature Kerouac reading to the accompaniment of jazz. 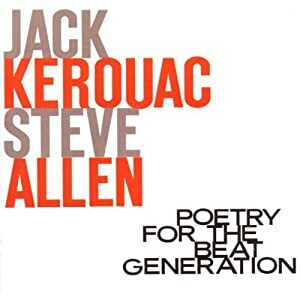 Poetry for the Beat Generation is a collaboration between Kerouac and Steve Allen (piano). This is a 14-track set, with quite a variety of material contained inside. The pieces range from the relatively lengthy opener, “October in the Railroad Earth” (7:08), to the very brief closer “I’d Rather be Thin Than Famous” (just 37 seconds). All of this is highly entertaining, to say the least. I also must say that even though Steve Allen is best known as a television personality, he is no slouch at the piano either. Of the two, I found Blues and Haikus to be even more provocative than the Steve Allen disc. Blues and Haikus features Kerouac plus saxists Al Cohn and Zoot Sims. For this second effort, things got quite a bit more adventurous. The impossibly-rare original LP featured just four songs. With the extra time that the compact disc format offers, Rock Beat have included two previously unreleased pieces from the same sessions. “American Haikus” (10:01) opened the LP, with “Poems From the Unpublished ‘Book of Blues’ (14:08) as the closer. In between, we get two relatively concise tracks, “Hard Hearted Old Farmer” (2:13), and “The Last Hotel & Some of Dharma” (3:49). I do not usually list all of the times on an album, but in this case, they seem somewhat relevant. So, to complete this task, let me just mention “Old Western Movies” (6:41), and “Conclusion of the Railroad Earth” (10:04), which (as mentioned) were recorded at the time of everything else on the record. By the way, those extras did appear on the 1990 Rhino set as well. While I must say that as much as I enjoyed the Poetry set, Blues and Haikus really turned me on. Both Sims and Cohn really got into their roles, and it shows. This is not one of those silly, clichéd things where a guy reads bad poetry to the sounds of bongo drums. Nope, this is real jazz, and the thoughts Kerouac expresses are pretty intriguing as well. The Beats often got a bad rap, probably because they were considered “threatening.” The term “beatnik” itself was meant as a jibe, as a reference to Sputnik. People who wrote poetry, drank cheap red wine, and played bongos were commie pinkos. I think this is great stuff though, so call me a fellow traveler. Besides, things would get a lot scarier for those who wanted to shut down free speech, just a few years later. I highly recommend these albums, both for the music, and for what Kerouac actually had to say.